Taylor scales down their popular GS body shape and offers up the GS Mini. Crafted from Sapele laminate back and sides with a solid spruce top and ebony fingerboard, the GS Mini offers a stunning blend of warmth and presence. A great rhythm guitar that also fares well in other styles, the GS Mini is a great all-around performer. 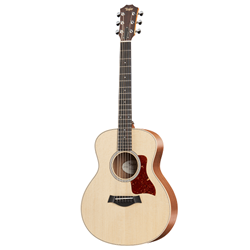 Just like you'd expect from Taylor, the GS Mini is a solid performer that will make any guitarist jealous. Just because it's smaller, doesn't mean it skimps on quality. Buy a GS Mini and take the Taylor sound anywhere. Includes Taylor embroidered gig bag.